Click the globe to listen to my Urban AC aircheck! Click the tower to listen to my news & gossip demo! Click here for my Urban/CHR Rhythmic aircheck! Go to the bottom here to download and save the text "standard" version of my resume. It's a regular (printable) MS Word resume with no color or graphics, unlike this website. 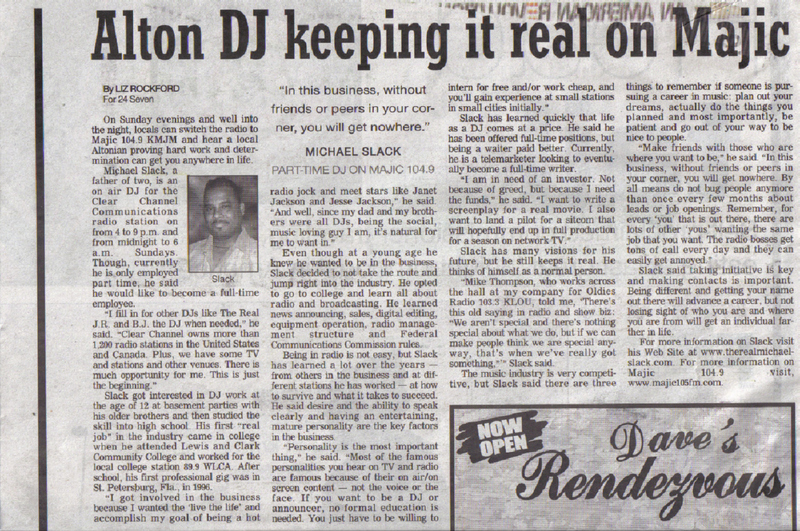 Click here to read an interview I did in a suburban St. Louis area newspaper. Right click (and choose "save as") to download the Alton Telegraph story. * Use the links below for other instant listening (or download) options! Left click here to play. Right click here to download and save. Left click to play. Right click to download and save. 1) If you already have an audio player (you've listened to things online prior to today), either go to your player properties and make sure it is your default player for mp3 audio files. It should play automatically after you click on the link. Remember -- with any listening option, it will take a little time for the file to load. 2) You can also can copy the audio file address by right clicking on the link and then viewing the properties. Choose "copy" in the properties menu by left clicking on it. Go to your player or browser and choose the "open" option. Go to "open a website or URL". Right click in the white box, and then left lick on "paste". Hit enter. 3) If that is too complicated, just write down the link after right clicking on it and choosing "properties". And then type it into your player or browser after choosing "open". Hit enter. 4) If this STILL does not work, just download the file and play it when you have time. 5) There is nothing wrong with this website. All the links/sound works. If you can do NONE of the above, there is either something wrong with your computer, or you are making errors. Give me a call or ask somebody to help you. You can also shoot me an email, and I can email the entire aircheck if your email account can handle it. If you need an audio player, get RealOne Player here. Get Windows Media Player here. If you have Winamp, Xaudio, MusicMatch Jukebox, or another player, try any of the above combinations. Still having problems? Send me an email. Please let me know what you think of my website and aircheck. right click the image below and then left click on "save target as". It's a regular (printable) MS Word resume with no color or graphics.